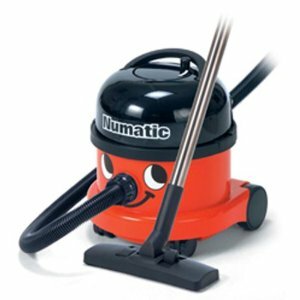 Numatic vacuums are arguably the most adorable brands thanks to their trademark cartoon faces. Numatic Vacuums were first manufactured in England back in 1969. This company is probably best known for starting the manufacturing of three types of vacuums from components that were already found in other consumer products. You might be surprised to hear some of the first models were fashioned from such things as used oil drums, castors made for furniture, and even suitcase handles. The end result was a sturdy and dependable cleaning machine for commercial or industrial use. This particular review is about the HVR200A Numatic Henry, HHR200-2 Henry, NRV200-22, and Het200 Hetty. These are most popular models of Numatic vacuums purchased by consumers. 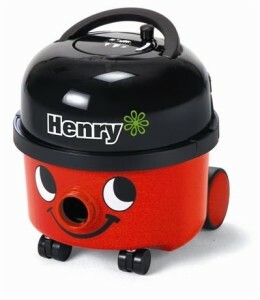 The Numatic HVR200A Henry has a cute little smile with a red and black body. The Henry HVR200A is known for serious performance while offering energy efficiency. You can start on the economy setting, but get high power cleaning with the touch of a button. The long, 10-meter cord has spring-free recoil for ease of use. The Tritex filtration system and HepaFlo dust bags offer 30% improvement in air quality. It features some stainless accessories and a powerful 1200W motor with professional-quality, two-stage performance. Consumers gave this vacuum an overall 4.5 star rating. Owners love that this machine has excellent suction and is easy to pull. They also noted that the long power cord and hose are very helpful. Complaints about this machine are sparse, but the most common issue amongst reviewers is that the wand system tends to fall apart. 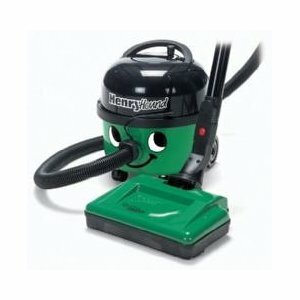 The Numatic HHR200-2 Henry is another of the Henry Numatic vacuum cleaners featuring the cute smile, with a little higher cost. This machine has several upgrade features compared to the other Henry, including a high-performance motor, a unique rewind system, an Odortex charcoal filtration system, and turbo electric power brush for quieter cleaning. The turbo head is perfect for cleaning up tiny hairs. It is also handy for cleaning stairs or getting cobwebs out of hard-to-reach corners. 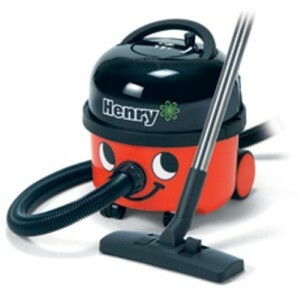 It is highly recommended for pet owners, giving it the nickname of Henry “Hound” Numatic vacuum. Like the other Henry models there were a few complaints. The plastic handle being flimsy is a common complaint among users. 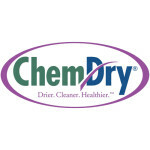 It is still capable of powerful cleaning and can help eliminate pet odors. The Numatic NRV200-22 is an economy model that offers a high-performance motor with all the features of the Henry for a lower coast. It features a high/low control on the brush head, along with MicroFlo dust bags with three stage filtration. You get a commercial 12.5-meter cord and storage system to extending your cleaning range. Consumers had little negative to report about the NRV200-22 commercial vacuum. The Numatic HET200 Hetty comes in a cute pink. Don’t let those girly looks fool you, though, because this machine features a powerful 1200-watt motor, 2 speed high/low controls, superb filtration, and an affordable price tag. The HET200 Hetty vacuum can pick up pet hair with ease and you can practically clean the whole house without unplugging this easy-to-carry model. 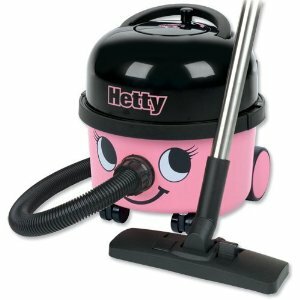 The Hetty features powerful suction and additional power-boost for tough cleaning jobs. Consumers had nothing negative to say about Hetty.